It's time for another ISC Challenge! For this challenge were were to use one of the new Fall Releases and this sketch. 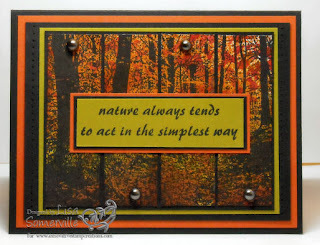 I opted to replace the DSP/card stock layers, with a stamped panel featuring the stamp sheet Walk in the Woods. On my main panel, I stamped my image in Archival Black, then did the Fossil Stone Technique (TJNL) - morphing the technique as I used my Adirondack Color Wash Sprays instead of inks. Would you like to play along with this weeks ISC Challenge and have a chance to win some FREE stuff? Simple - just create a card using and ISC images and the sketch shown above, and leave a link the ISC Blog for your chance to win 2 FREE stamp sheets of your choice. If you are loading to SCS - please use keyword ISCC12 so we can all see you work - but just a reminder you still need to leave a link on the ISC Blog. You have until September 21, to enter. Good Luck! Wow Lisa - this is really neat - it really looks like fall leaves - I am going to have try this out. Beautiful! I love the rich depth of the colors Lisa! This is incredible!!!! Absolutely beautiful! Lisa I really like how you split the walk in the woods image to fit the sketch - beautiful! wowzers! pulchritudinous!! I thought this was a photograph!